Valid Mon. thru Sat. ONLY Must spend $10 or more. Not good on Specialty Meats, or Specialty Seafood, Turkeys or Easter Ham, Sale Items and our gift cards. Not combined with other offers. 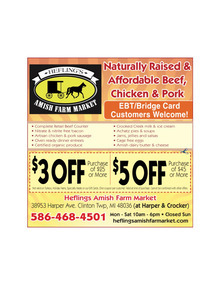 One coupon per customer per visit. Must present coupon at time of visit. Not valid with any other coupon. Coupon not to exceed $5. Expires 5-10-19. Also good at Andrea’s Fish Market Harper Location.